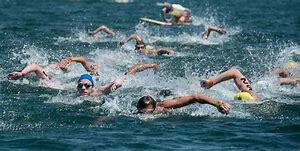 The Swim England Open Water National Age Group Championships 2019 take place at Rother Valley Country Park on Monday 5 August. The Swim England Open Water National Age Group Championships is the premiere competition for young open water swimmers in England. The Championships contain races over three distances; 2km, 3km and 5km. Age groups 12 and 13 yrs compete over 2km, 14 and 15 yrs compete over 3km, while 16, 17/18 and 19+ yrs complete the 5km course. Danielle Huskisson and Toby Robinson are just two swimmers who have used National Age Group medals as a platform for international success, going on to compete for Great Britain at World Championships.